What does partner/ Acro Yoga show us about how we build relationships of all kinds? How can we support our connection and communication with others through the practice of yoga? This original gem of a workshop will explore what’s going on psychologically and emotionally when we do partner/ Acro Yoga. It will help yoga practitioners build better relationships through yoga, and support yoga teachers to aid others in this regard. Basically we’re gonna have a lot of fun and go deep exploring who we are around other humans. The afternoon will help you improve this important aspect of your life because…well, we’re not hermits in the Himalayas! 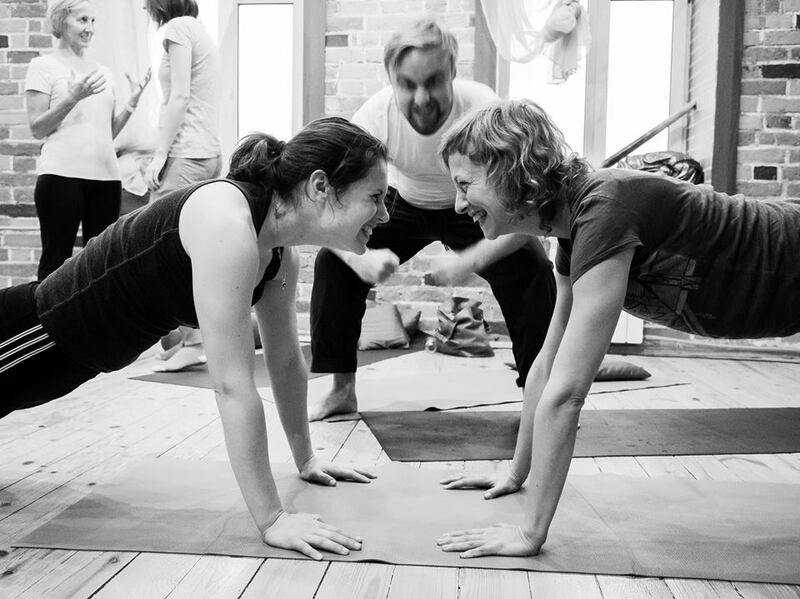 This workshop uses Embodied Yoga Principles. EYP emphasises psychological self-awareness and transfer of skills to daily-life. Anouska Anderson has a background in dance as a performer, choreographer and teacher when she began practising yoga on a regular basis in 1994 with a few breaks due to touring schedules. She had always found that yoga was the perfect complement for training and performing. Once Abby Hoffmann launched her Embodied Dancer Yoga Teacher training she knew she had found the perfect course for herself. Lucy Sabin is an EYP Teacher, influenced by the embodiment theories she encountered while studying Philosophy at university. Passionate about using yoga for positive life changes, Lucy writes articles on this topic for fairly major publications. Venue: So studio 4, The Place, 16 Flaxman Terrace, London, WC1H 9AT map.